Cell manufacturing processes are often complex and include manual or semi-automated steps across several devices. Standardization and reproducibility are crucial for GMP-compliant cell manufacturing. The CliniMACS Prodigy® is a stand-alone benchtop instrument that offers a variety of pre-installed, automated, and GMP-compliant cell manufacturing procedures, e.g., hematopoietic stem cell enrichment, generation of chimeric antigen receptor (CAR) T cells, and differentiation of monocyte-derived dendritic cells. 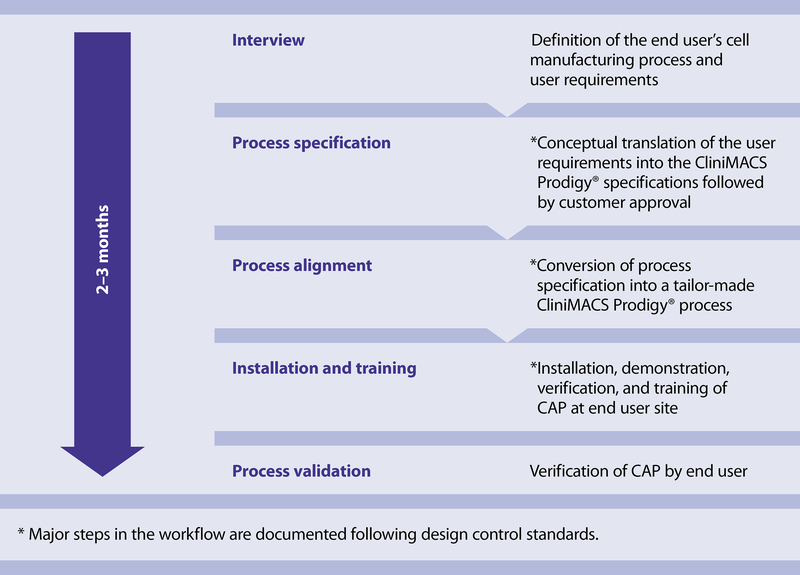 Customized Application (CAP) Service for the CliniMACS Prodigy Platform offers the translation of manual manufacturing processes into tailor-made, automated, GMP-compliant procedures. Our team of specialists configures and aligns predefined software modules in accordance with customer specifications. Join Dr. Peter Jähn and his webinar on the CliniMACS Prodigy Platform, including features, benefits, and workflow examples. The second part of the webinar focuses on the Customized Application (CAP) Service, which provides tailor-made, automated procedures for your specific cell manufacturing application. Contact us and enhance your cell processing workflow today!